Digital Drawing for Landscape Architecture: Contemporary Techniques and Tools for Digital Representation in Site Design, Second Edition bridges the gap between traditional analog and new digital tools by applying timeless concepts of representation to enhance design work in digital media. 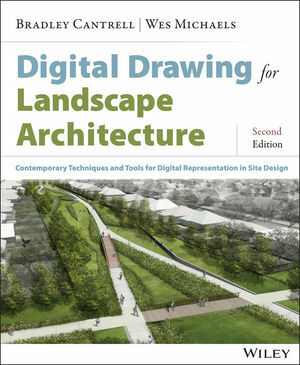 The book explores specific techniques for creating landscape designs, including digitally rendered plans, perspectives, and diagrams, and the updated second edition offers expanded coverage of newer concepts and techniques. Readers will gain insight into the roles of different drawings, with a clear emphasis on presenting a solid understanding of how diagram, plan, section, elevation, and perspective work together to present a comprehensive design approach. The book takes a tutorial-based approach to digital rendering, allowing readers to start practicing immediately and get up to speed quickly. Communication is a vital, but often overlooked component of the design process, and designers rely upon their drawings to translate concepts from idea to plan. Digital Drawing for Landscape Architecture provides the guidance landscape designers need to create their most communicative renderings yet. BRADLEY CANTRELL is Principal of Visual Logic and Associate Professor of Architectural Technology at the Harvard Graduate School of Design. WES MICHAELS is a Principal at Spackman Mossop Michaels Landscape Architecture and an Associate Professor of Landscape Architecture at Louisiana State University.